Project Description: Create a personalized pendant featuring your own monogram, Victorian vintage roses, and gold leaf accents! Cut a square background image from the printed paperback text. Glue into the Frame Charm with a toothpick and Tacky Glue. Trim the Victorian Rose clip art to fit in the bottom third of the Frame Charm Glue in place. Use the Krylon Gold Leafing Pen to add gold accents to the clip art. Cut out an initial from the printed Computer Grafix Laser Film. 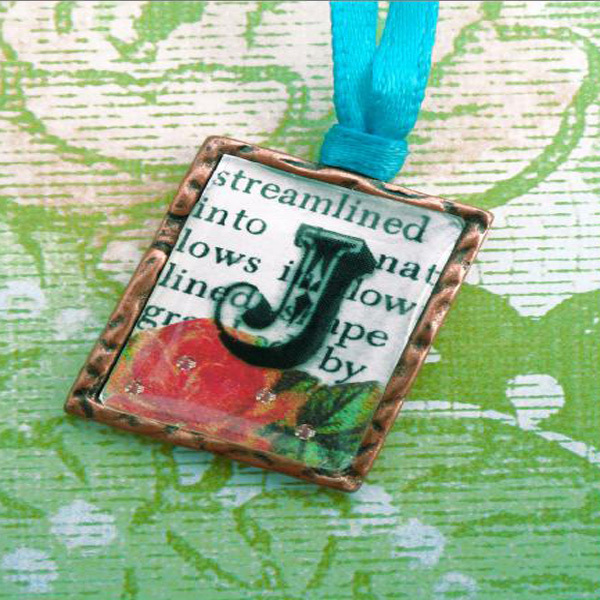 Glue into the frame charm. Peel the back off the Clear Charm Cover and adhere it to the front of the rectangle charm covering the collage inside. Thread the ribbon through the loop at the top of the re tangle charm.